(CBS/AP) BURIEN, Wash. - Before he killed his wife and teen daughter and then retreated to a remote bunker in Washington's Cascade Mountains, Peter Keller recorded a video where he said he looked forward to robbing banks and was happy not to "have to worry about Lynnettee or Kaylene" anymore. "It's getting to the point where just trying to live and pay bills and live as a civilian and go to work, that just freaks me out," the 41-year-old said in a video clip released Thursday by the King County Sheriff's Office. "It's actually more comfortable for me to think about living out here, robbing banks and pharmacies, just taking what I want for as long as I can. At least it'll be exciting." Keller shot his wife, Lynnettee, and his 18-year-old daughter, Kaylene, at their home in North Bend, east of Seattle, in April. He set canisters of gasoline on the kitchen stove, turned it on, and headed to a fortified, camouflaged bunker he had spent the past eight years building into the steep, thickly forested slope of Rattlesnake Ridge. King County sheriff's detectives spent days trying to figure out where he was. They narrowed down his hiding spot with tips from the public, who had seen Keller's red pickup at the Rattlesnake Ridge trailhead; a photo taken from the bunker that showed outlet stores in the distance; and the work of trackers who saw his boot-prints in the muddy ground. Keller killed himself as dozens of SWAT officers moved in - an outcome he predicted in his video. 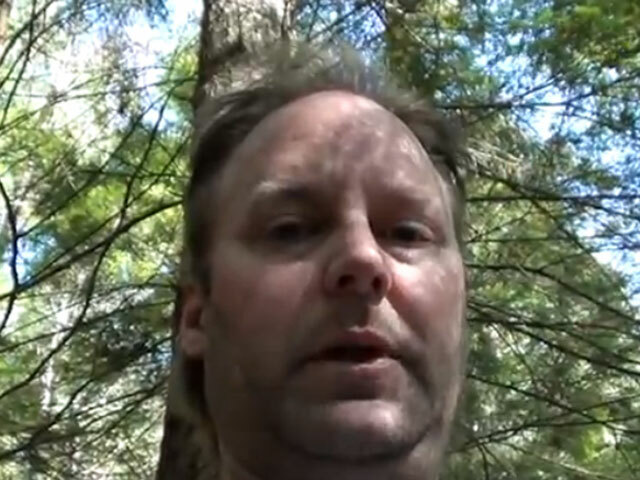 Looking down into a handheld camera, with his head wreathed by evergreen trees and the blue sky, Keller stated flatly: "If I get caught, I'm just going to shoot myself. I could be dead in two weeks or three weeks, I don't know. It's all up to chance at this point." He added: "I do have my escape and it's death. Shoot myself. I'm OK with that." The sheriff's office said it was releasing the video now because recent forensic tests recently proved that one of Keller's guns was used in the murders. There were no other suspects. In a news conference, Sheriff Steve Strachan also announced that tens of thousands of dollars was found bundled in the bunker, though he declined to specify how much. Lynnettee's family announced that they would use the money to establish a scholarship fund in Kaylene's memory (www.kaylenesfund.com ) for women who attend DigiPen Institute of Technology in Redmond, where Kaylene had hoped to study video game design. "The family didn't really find there was a problem with Peter," said Lynnettee's twin brother, Gene Rocha. He described Keller's relationship with his daughter as loving.